The versatile DT8500 is designed with guitarists and keyboard players in mind. It features a height adjustable padded seat and padded back rest. Braced legs adds stability, while quick set up and tear down make it an ideal solution for the gigging musician. Ideal for guitarists and keyboard players. 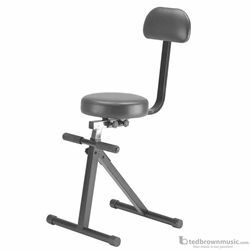 10 Position height adjusts from 21-31", 12 1/4" vinyl padded seat; braced legs. Height adjustable seat creates a comfortable playing position; Quick to set up and tear down; Adjustable backrest.